Question: Why is Mother Kali represented with four arms? Sri Chinmoy: First of all, I wish to tell you that this is the conception of the artists. Mother Kali is the Divine Mother in her power aspect, and she is not at all like the representations which you see in pictures and posters. In the highest world she is golden, most beautiful and most luminous. When she enters into the vital worlds to fight against fear, darkness, imperfection, obscurity and ignorance, she assumes a divinely heroic quality. Yet even in the vital world, she does not look like the pictures that you see. The Indian artists traditionally insist on portraying her this way. They feel that when she is striking the hostile forces, cutting them with her scimitar and so on, she must look like this. 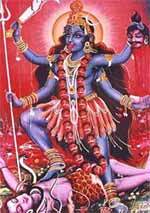 But when the real Mother Kali assumes human form, even while she is fighting against ignorance, she has only two arms. In the pictures we see four arms, each performing a different action. With the arm wielding the scimitar, Kali is striking the hostile forces. The second arm holds the trident which is the weapon and emblem of her consort, Lord Shiva. This weapon symbolises his power. So this second arm is shown holding and using Shiva’s power. The third arm she is holding aloft the head of the greatest demon, Mahasura, whom she has conquered and killed. And with the forth arm she holds the vessel which is catching the blood pouring from his severed head. This is all the pure imagination of the artist. In India we have a set of sacred books called the Puranas. They are not as well known in the West as the Gita, but in India they are very well known and well loved. They are full of simple, colourful stories about great Indian deities. In those books you will read about Kali and all her battles in the inner worlds. It is Mother Kali who represents the transforming Power of the Supreme. She kills the hostile forces in our human nature and takes us as quickly as possible to the Highest. She does not kill the human being; she kills only the imperfection and obscurity in our human lives.